Research has demonstrated that people living in areas areas of low socioeconomic status are bitten and attacked by dogs more frequently than people in neighborhoods of greater affluence. 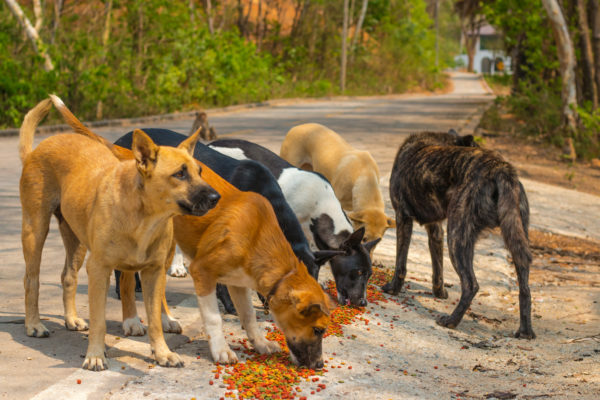 This in part prompted a study documenting the frequency of dog bites by stray dogs onto people living in the southern Dallas, Texas. The southern part of Dallas contains some of the most poverty-stricken neighborhoods in the city. The study was also undertaken as a result of a well-publicized fatal dog attack in southern Dallas by a pack of dogs on a 52 y.o lady in May, 2016. Moreover, according to a August 8, 2016 story in the New York Times, residents in southern Dallas have been complaining about the stray dog problem for years. Some have taken to walking with sticks for protection and people avoid parks. The study was undertaken in June-July 2016 and results reported in August 2016. One interesting finding was the number of stray dogs in southern Dallas relative to the number of stray dogs in the more affluent northern Dallas. A staggering number of about 8,700 strays were estimated to be roaming the streets in southern Dallas. The study found 135 stray dogs in an area of about 176 linear miles. This contrasts remarkably with just a single stray dog found in northern Dallas. Another remarkable finding was that in northern Dallas 80% of the dog population, compared with only 20% in southern Dallas, was spayed or neutered. Results also showed that the dog bite frequency in Dallas increased 15% per year since 2013. Similar results have been found in other parts of the United States. For example, in Detroit when the city went bankrupt in 2012, stray dogs began roaming neighborhoods and biting people. In fact, packs of stray dogs exist in all heavily populated urban areas in the United States and throughout the world. And in India the problem is critical: deaths from rabies as a result of dog bites from a stray dogs is not uncommon. In Dallas, like other cities, there’s no easy fix. Mass roundup of stray dogs is not a long-term solution. This is what animal control agencies in India and China have repeatedly attempted but yet the rabies epidemic continues. Instead, will about responsible pet ownership (i.e. not feeding stray dogs; not allowing dogs to roam; strict licensing regulations; compulsory neutering in certain situations) and the need for spaying and neutering is essential. Another solution, hopefully recognized by Dallas city officials, is the urgent need to make available to low income families affordable veterinary care and dog training classes. As an aside, it is worth noting that stray dogs often form packs. This factor compounds the danger stray dogs present to the public. It is not well understood if these packs represent a permanent group of stray dogs or alternatively companion dogs which leave an owner’s home on a temporarily basis to join an already existing pack during the day.